Learn how to integrate your JMeter tests into Jenkins by working directly with JMeter or running a Taurus test in Jenkins. As performance testers, we contribute to our development team by easing the execution of performance tests. The goal is to integrate testing to make it a natural part of the lifecycle of any development project. In this blog post, we will see how to integrate our open source JMeter performance tests into open source Continuous Integration tool Jenkins. We will go over two different options and explain when it is better to choose each one. Working directly with Apache JMeter™ in Jenkins. This option is for cases when the tester runs JMeter using the console mode. Running a Taurus test in Jenkins. This option provides more flexibility in the test configuration. It can also connect you to BlazeMeter reporting. 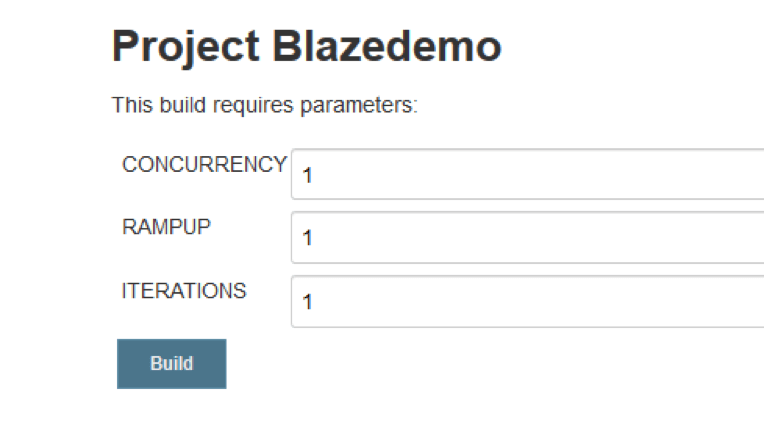 A third option is to run your performance test in BlazeMeter, easily integrate it into Jenkins with the BlazeMeter Jenkins Plugin, and use the built-in performance testing graphs there. In my examples, you will see that I use different paths (I'm using Windows), so let me first explain what each of them mean so you can follow my guidelines with your own folders. C:\apache-jmeter-4.0\bin\: Path to my JMeter bin folder. C:\Jenkins: Path to my script (JMX file). C:\Jenkins\Report: Path to my Report folder. We assume you already know how to write your script in JMeter. If you need more assistance, you can learn from the free online JMeter academy. Extract your JMeter bin folder. In Jenkins: create a Freestyle project. Add a command with a link to your extracted bin folder and the path to your script. (The JMeter test will be run in non-GUI mode. Learn more about how to run JMeter like this from here). You can also update JMeter script values. For example, Jthreads is a property that defines the number of threads. Configure the property in JMeter and update the script in Jenkins. In JMeter, add jmeter.save.saveservice.output_format=xml to the user.properties file (located in the /bin folder of your JMeter installation), to allow JMeter to publish the results in XML format. These results will then be published by Jenkins in the Performance Trend report that we show below. Learn more about the aspects that make our system fail, in time, in order to avoid having the same error happen in other areas of our application. Therefore, it becomes important for us to quantify the test results for each test build through comprehensive graphs. Even better, we should be able to easily analyze the most common KPIs, like response time, throughput, and error results. Go to Jenkins -> Manage Jenkins -> Manage Plugins -> Available Tab and find the plugins. These plugins will help you to graph (Plot) the results and set up the test (Performance). So this step is the first thing you should do for any integration option. Read more about the Jenkins Performance Plugin here. In Jenkins, in Post-build actions -> Publish Performance test result report - Add the same path to the jtl that you specified in the build. So, the Jenkins report will read the information to show from the JMeter report you have specified. 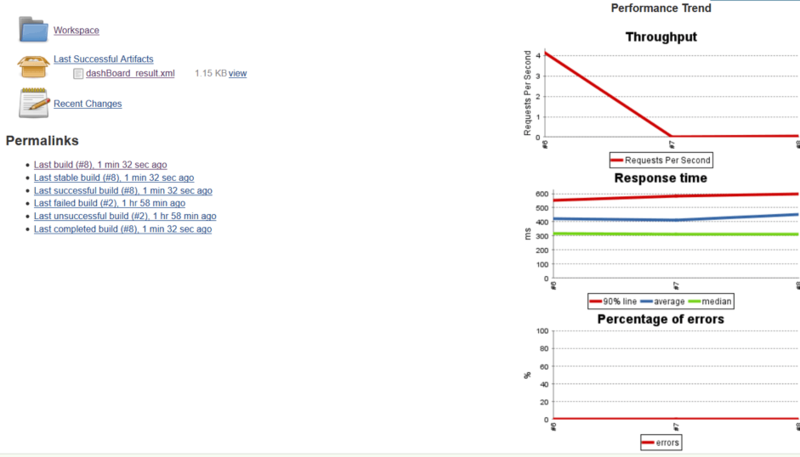 Click on "Display Performance Report with Throughput" if you want to also see this graph. 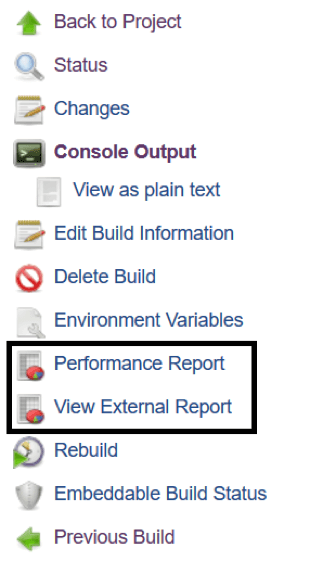 If you want to display the performance Report per test case, you just need to check this option. The Fail Build option is checked by default. All the other setting names are quite self-explanatory. If everything went well, you will see the build and the Performance Trend created. 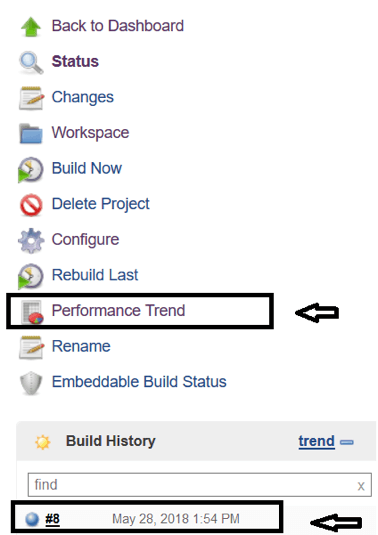 If you go into Performance Trend menu, you will see these three graphs and also a link that takes you to the Last Report. Throughput: It's important to analyze this value if it changes because this could be a symptom of a possible problem. Response time: In order to keep good application performance, it's important to monitor the times in your dashboard. If the times increase, you should check the last commit or build, and check what changed in your app. Errors: If the number of error increases, you should review the last changes made in your application and your script. Remember that app changes could break the script. Finally, you can review the values of the Last Successful Artifacts with data as Average, Median and Percentile Response Time. Another way to integrate JMeter in Jenkins is by using Taurus, an open source test automation framework for easily running performance tests. 2. 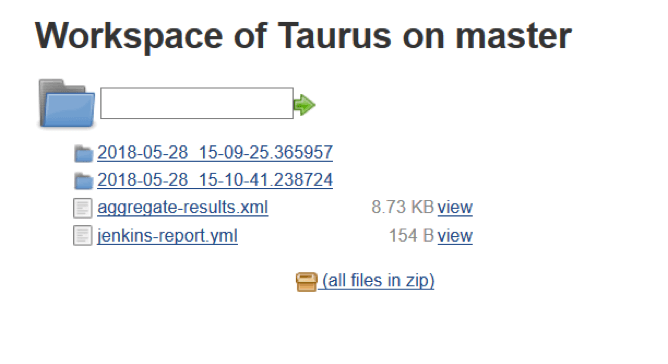 If you don't have JMeter, the Taurus build will install it for you. If you already have JMeter in your Jenkins host, add JMETER_HOME to your PC environment variables. 3. In Jenkins: create a Freestyle project. 4. Go to the Build tab and add a build step: Run Performance Test. This scenario executes 40 users, 1 iteration, and plugged in the users in the first 10 seconds of the test. 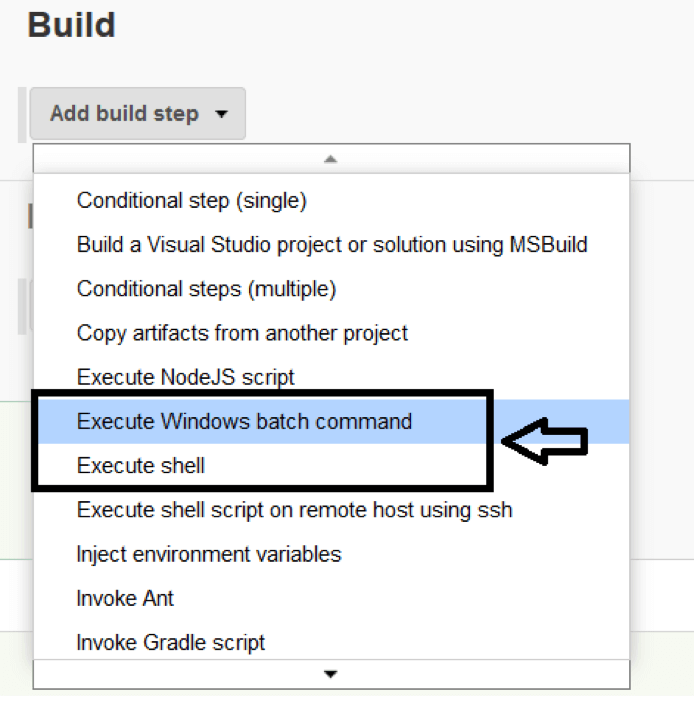 With this option, you can easily set up the scenario to configure the build. Even better, in Jenkins, you can define three string variables: CONCURRENCY, RAMPUP, ITERATIONS. As a variant of the option -o execution.0.iterations=1 you could use -o execution.0.hold-for=2m or the time you would like to hold the test. So the test will run until that set time, iterating the actions. Also, in the same way, you could parametrize the hold-for value. If everything went well you will see Taurus running in the console output. The command -cloud added before, will generate an External Report, so not only will you have the Performance Report but you also will have a BlazeMeter Report clicking over "View External Report." Click on it and BlazeMeter will open up for you. BlazeMeter provides many insightful KPIs in colorful graphs. You can also drill down analyze to labels or geo-locations, both in real-time and for results collected and stored over months. I like how the Taurus option manages the Jenkins workspace, creating a folder for each build. You can access the logs and KPIs of your execution in an easy way. As you can see, the first option is easy to configure for people who are used to using the JMeter command line. But, in both options, you could set up the scenario in a flexible way without having to edit or modify the script. Share your favorite integration option with us in the comments section! I hope this blog helps you set up your tests in Jenkins, and more importantly that it helps you to add your test to the CI lifecycle. Published at DZone with permission of Leticia Almeida , DZone MVB. See the original article here.